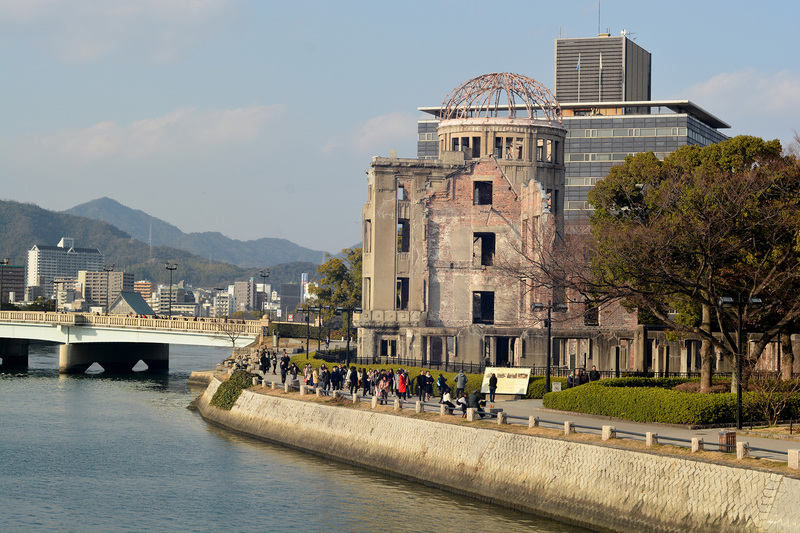 Cindy Kelly, founder and president of the Atomic Heritage Foundation (AHF), traveled in Japan from February 7 to 22, 2019, visiting Tokyo, Hiroshima and Nagasaki. The purpose was to talk to Japanese government officials, museum directors, university professors, and hibakusha (atomic bomb survivors) about the atomic bomb and its legacy. Four years ago on May 1, 2015, Kelly met with the mayors of Hiroshima and Nagasaki in New York City. The Mayors urged that the interpretation of the Manhattan Project National Historical Park include the devastating impacts of the atomic bombs on the people and cities in Japan. On this trip, Kelly was able to visit both Hiroshima and Nagasaki for the first time and record interviews with the Mayors. As President of the Mayors for Peace, Mayor Kazumi Matsui of Hiroshima is dedicated to ensuring that the full story of the atomic bombing is told so that there may be “no more Hiroshimas.” Mayor Tomihisa Taue of Nagasaki is equally concerned to convey the impact of the atomic bombings on Nagasaki. As leaders of the Mayors for Peace, they have recruited over 7,700 mayors worldwide and advocated for the United Nations Treaty on the Prohibition of Nuclear Weapons which passed on July 7, 2017. In Hiroshima, after exploring the Hiroshima Peace Park (pictured) and looking at the impressive exhibitions at the Hiroshima Peace Memorial Museum, Kelly interviewed Museum Director Kenji Shiga and Chairperson Yasuyoshi Komizo of the Hiroshima Peace Culture Foundation. She also recorded a presentation by hibakusha Keiko Ogura. The next day in Hiroshima, she interviewed Robert “Bo” Jacobs of Hiroshima City University and Tomoko Watanabe, founder of Asian Network for Trust. After examining several enormous trees which survived the atomic bomb, Tomoko introduced Kelly to okonomiyaki, Hiroshima’s delicious specialty. Later, Kelly met with Mariko Nishizawa and Yuriko Koshobu to learn about the Hiroshima Prefecture’s Peace Promotion Project. In Nagasaki, Kelly had an excellent tour of the Nagasaki Atomic Bomb Museum and Memorial Hall followed by an interview with Mayor Taue. Other interviews included Masao Tomonaga, who was two when the atomic bomb struck Nagasaki. Like his father, he became a doctor and later director of the Japanese Red Cross Nagasaki Atomic Bomb Hospital. In addition, Kelly interviewed Yoshiro Yamawaki and Mitsugi Moriguchi who shared their experiences as hibakusha. On March 10, 2018, Moriguchi became the first Nagasaki survivor to visit the B Reactor at Hanford. 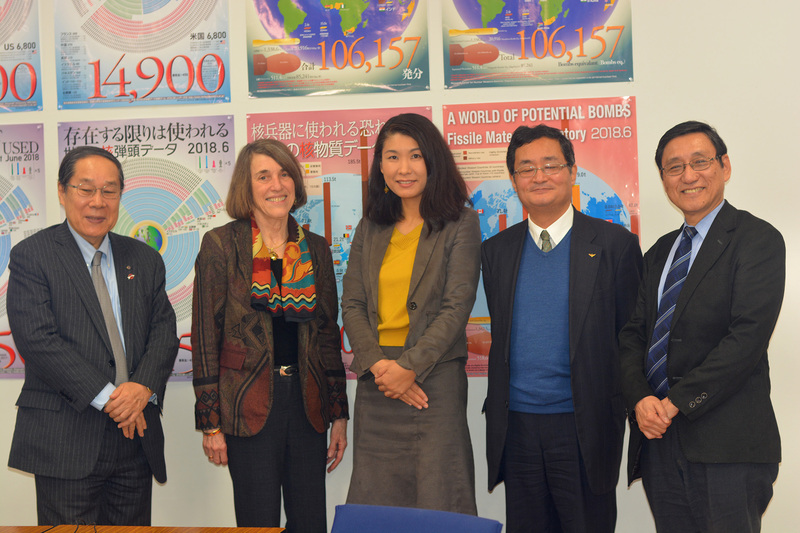 A t Nagasaki University, Kelly met with Director Tatsujiro Suzuki and his colleagues at the Research Center on the Abolition of Nuclear Weapons (RECNA). They were interested in AHF’s plans to create educational resources for high school teachers and students on the atomic bombs and their legacy. In Tokyo, Professor Takao Takahara invited Kelly to address students and other faculty members at the Meiji Gakuin University. One student Keyao “Kyle” Pan is getting his doctorate at the University of Chicago. Faculty member Yuko Shibata recently published “Producing Hiroshima and Nagasaki,” a book about interpretation in literature, film and transnational politics. After a very lively session, Professor Takahara introduced Kelly to a delicious soba (buckwheat noodles) dinner in a small restaurant nearby. The success of the visit would not have been possible without the invaluable help of Sachiko Komatsu of the City of Hiroshima and Yayoi Minokawa of the City of Nagasaki. Ms. Kamatsu and Ms. Minokawa arranged many of the interviews, juggled schedules and venues, and were excellent translators. AHF is deeply grateful for their extraordinary assistance. The trip to Japan was very stimulating and inspiring. With the 75th anniversary of the end of World War II in August 2020, AHF is expanding its efforts to include Japanese perspectives in its resources online and to create a series of engaging educational resources for high school teachers and students. Most immediately, AHF hopes to publish the interviews taken in Japan on AHF’s website this summer and looks forward to continued dialogue and collaboration in the future.